One of the things I have long believed is where true community strength really comes from. In this place where industry is so prominent I worry that occasionally people will think strength comes from that industry, or even from government. And while those aspects of our community are very important that is not where true strength is found, or developed. 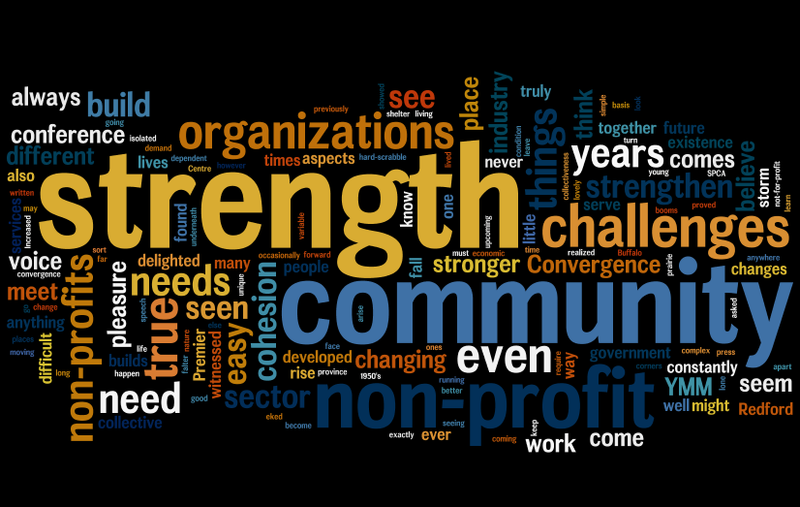 The true strength of our community comes from our non-profit and not-for-profit organizations. During the time I have written this blog I have had the profound pleasure of getting to know those individuals who work in our non-profit sector. From the Wood Buffalo Food Bank to the SPCA to the Centre of Hope to so very many others I have seen the incredible work they do, and witnessed the way they impact the lives of those in this community. I learned that things are never as simple as they seem, and that things that on the surface seem to be easy are far more complex than I ever realized. Running non-profit organizations is not easy, even in a community known for boundless generousity. And while I have witnessed first hand the work they do I have also seen the challenges - and there are many. As we who live here know this community is changing on an almost daily basis. Over my decade here I have seen booms and busts, economic upturns and downturns, and change of the sort of magnitude I've never quite seen anywhere else. Life here is a constantly moving stream, always variable, always fluctuating. Businesses come and go, people arrive and leave, but the constancy of the human condition remains - there are fundamental needs, and those are the ones our non-profits serve. There is the need for shelter, and food, and assistance in all aspects of life. The ever changing nature of this place makes running a non-profit even more challenging than in other places perhaps, because the ground is constantly shifting underneath them. And as this community looks at exponential growth there are even more changes - and challenges - ahead. Increased needs, different needs, more demand for services, and more pressure from all corners, and suddenly you have the perfect storm of challenges for non-profits. It is easy to falter in such a storm, to fall apart and become isolated from each other, struggling to meet those challenges. 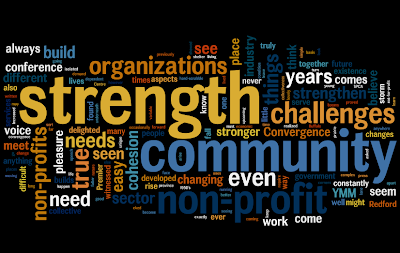 I am one of those who thinks that anything that builds strength and cohesion in our non-profits benefits us all, because with a stronger non-profit sector can only come a stronger community. And that is why I am so delighted about an upcoming two-day conference called "Convergence YMM". In a press release about the conference the definition of convergence is given as a "coming together" from different directions, and how true this is of our non-profit organizations. They may serve different needs within our community, but where they converge is the necessity of their services, and the need for their strength. I also happen to be one of those that believe a collective voice is always stronger than a lone voice, and so anything that builds cohesion and collectiveness will build strength, too. And that is truly the beauty of Convergence YMM because the goal is to do exactly that, to build cohesion to create a non-proft sector that can not only weather all the impending changes in this community but rise to meet them in spectacular fashion. The future of this community must be developed in a way to include our non-profits, to strengthen them so they can in turn strengthen all of us. You see I think what is most unique about non-profits is that they arise to meet a need. I think that true strength is found not when times are good, but when times are difficult. If you had asked my parents what formed them, what showed their strength, I doubt they would have pointed to the last years of their lives when they lived in a lovely middle-class home in a beautiful prairie city. I suspect they would have said that their young years living a hard-scrabble existence during the depression years in Saskatchewan were what proved their resilience, and the years in the 1950's when they eked out an existence on a little farm in that province (with four little girls, my sisters, dependent on them). It is easy to have strength when things are going well, when all needs are met and there is plenty of money and lots to smile about. It is, however, when need is apparent, when things might be difficult, and when there are challenges that you find true strength - and so too it is with non-profit organizations, who tackle those challenges every day and wrestle them down. In order to keep fighting, though, they need strength, and cohesion, and a collective voice that can help bring strength to all of them, even when the challenges might seem overwhelming. I am delighted that I will be attending Convergence YMM, and I hope to be able to share with the community what I learn there. It is an honour that Premier Alison Redford will be addressing the conference in a keynote speech, because I believe Premier Redford has a very clear understanding of the value of non-profit organizations as well, evidenced by conversations I have had with her previously. It will be, for me, a pleasure to see our local non-profit organizations come together to build the strength and resiliency that they will require to face our changing future, but it is even more than that. It will be a pleasure for me to see them continue to strengthen themselves so they can strengthen the community, so they can make this a better place for us all. I believe this community will not rise and fall with the strength of industry or government, but rather with the strength of our non-profit sector, and so I truly look forward to seeing them build the kind of strength that will see them, and all of us, through all the years that lie before us.